I’ve finally gotten the hang of thrifting! I can’t wait to show you what I found for this year’s Christmas Goodwill challenge! 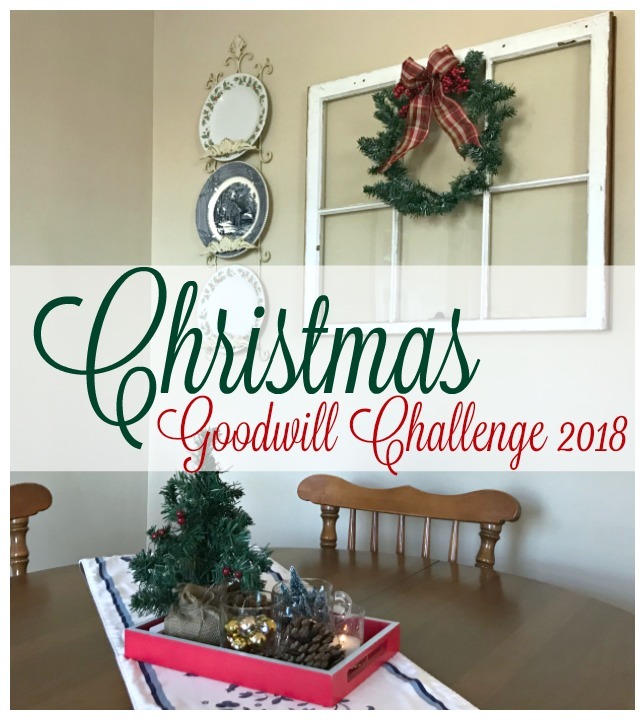 In case you’re not familiar with this challenge, it is where you spend $5 or less on a secondhand item that you can use to decorate your home for the season. It’s such a fun adventure! Over the years I’ve learned to shop with a purpose. I don’t just wander the aisles of my local thrift store, looking for something that might catch my eye. 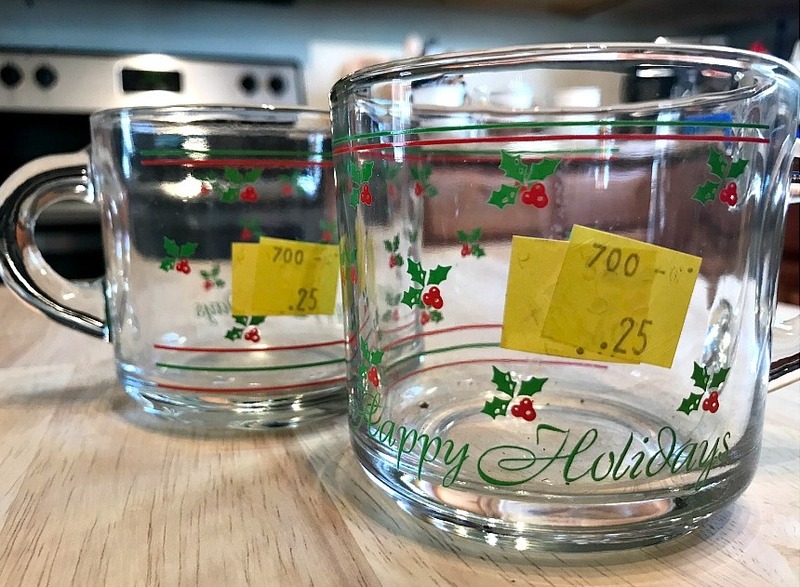 Although I’m always looking for blue and white dishes, ginger jars and vases, I also look for particular vintage holiday decor items. While Paul refereed lacrosse at a school in Kentucky one afternoon, I found the only store in town that wasn’t a Walmart – a flea market! Among the aisles and aisles of junk I discovered these little mini coffee cups marked down to a quarter. I snatched them up, knowing they would be perfect for this challenge! 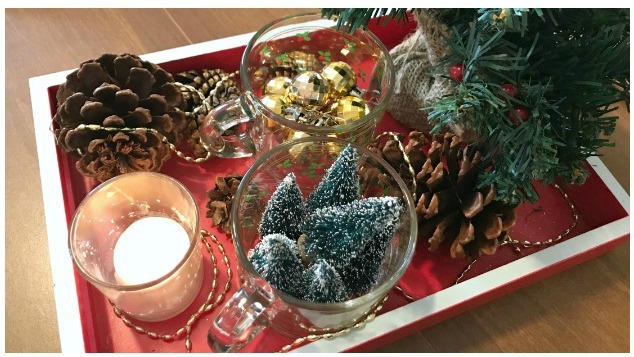 I filled one with a few mini trees – the other with a handful of mini gold ornaments. 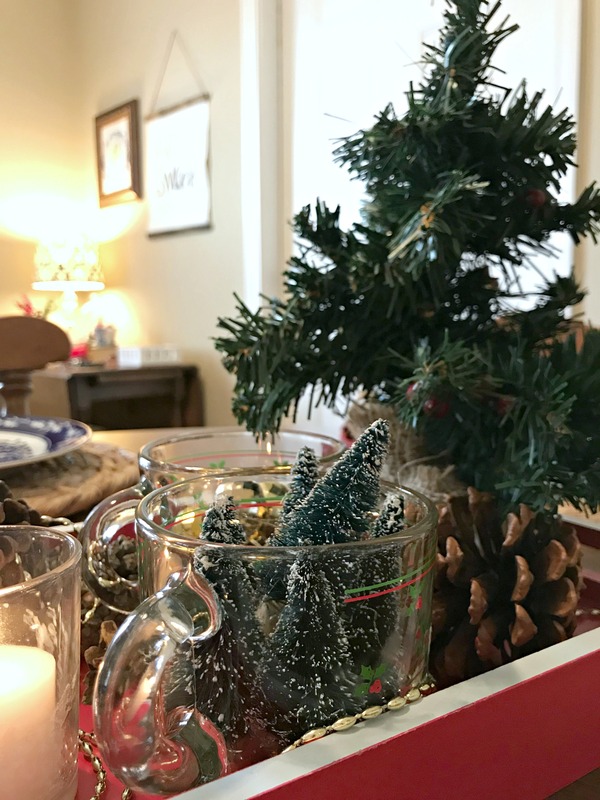 They were arranged on a red wooden tray, along with some pinecones, a votive candle and a little Christmas tree (all things from my Christmas decor stash!). 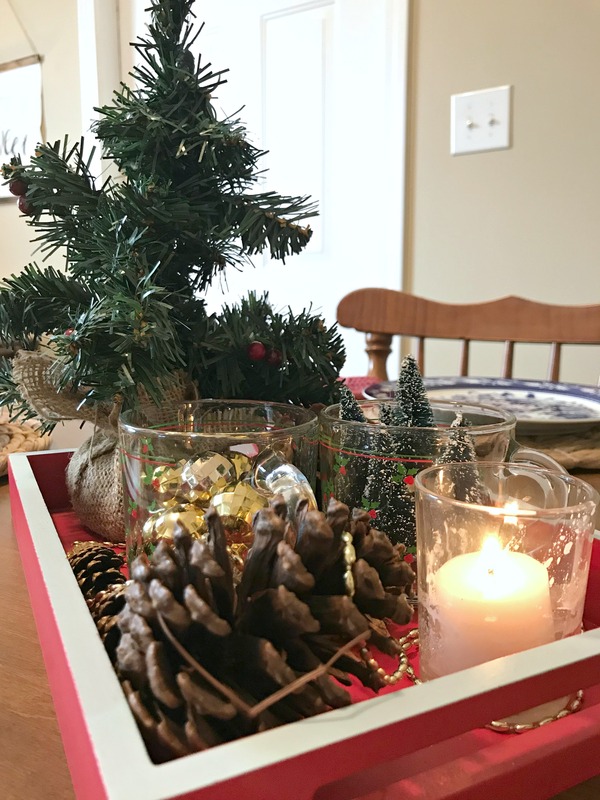 Using a tray to anchor a dining table centerpiece makes it so functional – especially if you use your table for school, work or as your counter space! My first apartment had absolutely no counter space, so baking or cooking always required use of the table. I got in the habit of creating functional centerpieces that could easily be relocated! There’s one other item I purchased for this challenge. Watch my short video below to see what it is! If you live near me and want to know my favorite thrift stores, send me a message on Instagram! I’ll be glad to share my favorite spots with you! I am loving trays these days!! They hold so many options. Every time you show a Goodwill find turned adorable home décor, I want to jump up and start thrifting. DO IT! 🙂 It takes a while (at least for me) to figure out the “good” stores, but once you do – just pop in there once a month or so. You’ll find some goodies! I’m so excited for you! Thrifting is such a fun adventure. Glad you’ve come across some good stores and some good finds to spark your interest. I am currently on the hunt for some vintage floral art work in thrift stores, but am not having any luck. You know, I always flip through the frames when I’m in the thrift store but never find anything either. Hope you have some thrifting luck soon!